A glance at Vampyr should begin with a glance at its Danish begetter, Carl Theodor Dreyer (1889–1968), whose relatively restricted output has not prevented him from being spoken of as one of the greatest film directors of all time. The accolade rests not so much on some perceived technical prowess as on the recognition of a very special spiritual integrity: everything he touched—and he touched many different genres in the course of his lifetime—he made inimitably his own. Proud, shy, and reticent in his personal life, he gave all he had to the burgeoning craft of cinema. Somehow or other, the profundity and heroism of that sacrifice are communicated as a felt value in his movies. Each of them has a beautiful seriousness. The bulk of Dreyer’s filmography—nine films out of a total of fourteen, stretching from his debut in 1919 to The Passion of Joan of Arc in 1928—belongs to the silent epoch. And most of it was made outside his native Denmark. The country had enjoyed a brief golden age of cinema just prior to the First World War, but by the time Dreyer was establishing himself, in the late teens, this flowering was ending, and he was forced to seek his fortune abroad, wherever he could find backers, which in practice meant Germany and France. The Passion of Joan of Arc, his last effort in the twenties, is one of the finest of all silent films—an epitome of the art form as it had developed up to that point—but it was not a success with the public. 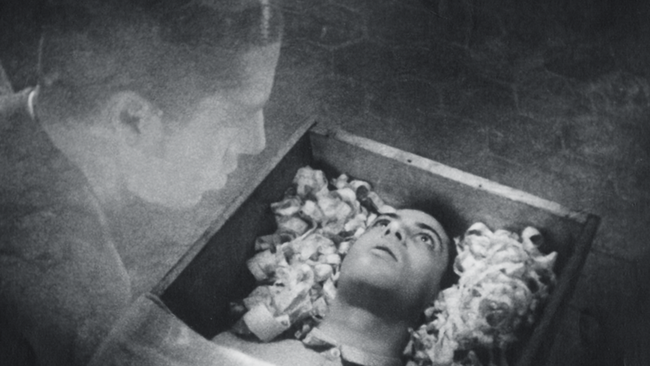 Notoriously, Vampyr, his next work and first sound film, would fail to find an audience too, and even more disastrously than Joan of Arc did, so it is worth emphasizing that this strange, hermetic, and experimental film was originally conceived of as, if not exactly a “potboiler” (the concept is impossible in Dreyer’s case), then at least something possessing—he hoped—healthy moneymaking possibilities. After the great expressionist outburst at the beginning of the decade that had issued in masterpieces like The Cabinet of Dr. Caligari (Robert Wiene, 1920) and Nosferatu (F. W. Murnau, 1922), vampires, horror, and darkness were in vogue again toward the end of the twenties—both in Europe and the United States. In films such as The Lodger (Alfred Hitchcock, 1927) and The Cat and the Canary (Paul Leni, 1927), Dreyer discerned, or thought he could discern, instances of a genre where broad popular appeal was allowed to exist within the framework of artistic integrity. The material Dreyer and his coscenarist Christen Jul chose to base their screenplay on (the director always worked from literary sources) was a collection of supernatural tales entitled In a Glass Darkly, by the nineteenth-century Irish Huguenot writer Joseph Sheridan Le Fanu—one tale in particular standing out from the collection, “Carmilla,” a strikingly modern vampire story with a scarcely concealed lesbian subtext. Since the writer of these lines professes kinship with Le Fanu, there has always been the hope harbored that Dreyer had a special fondness for this author. Alas, according to Casper Tybjerg, currently writing what promises to be a major and long-needed biography of the director, there is no evidence, one way or the other, that this was the case. Other considerations may have been rather more important. After the legal trouble Murnau had had with the Bram Stoker estate on the release of Nosferatu back in 1922, one thing that had to be got right was that the material should be out of copyright. And here, as luck would have it (Le Fanu died in 1873), Dreyer was on safe ground. In any event, it is a somewhat contentious question how much Vampyr really is based on “Carmilla.” The French film historian Maurice Drouzy, who has written extensively on the director and knew many of his collaborators firsthand, is only one of a number of authorities who believe that the debt is quite marginal. “While certain directors don’t hesitate to pillage literature without naming their sources,” Drouzy wrote in his 1982 book Carl Th. Dreyer né Nilsson, “Dreyer, here, was engaged in an exactly opposite maneuver, that of attaching his own ideas to an innocent third party. Why didn’t he, I wonder, own up to the fact that he invented the whole thing?” Drouzy’s answer—that Dreyer needed the camouflage to protect the deepest personal meaning of the film from the public’s and critics’ gaze—is suggestive, and we will come back to it. Still, it is fair to add that Drouzy’s take on the adaptation (or as he would say, the pseudoadaptation) is not necessarily the last word. Other writers—notably S. S. Prawer in his fine monograph Caligari’s Children: The Film as Tale of Terror and David Rudkin in an exceptionally intelligent essay published recently by the British Film Institute—have been more patient with the mysterious ways by which literary sources “infiltrate” scenarios, not always head-on, yet in the end decisively, through their accumulation of often surprising detail. A crucial linkage here is that the vampire, in both story and film, should be female. In “Carmilla” she is young and beautiful, whereas in Vampyr, of course (it is one of the most striking things one remembers from the film), she is a stout, aged witch with a walking stick. As Prawer points out, the cue for this change is provided by the original, in the figure of Carmilla’s terrifying mother, briefly introduced early in Le Fanu’s tale, before just as suddenly vanishing. Nor is the intimate, adolescent, and sexual subtext of the story totally absent from the movie—mediated here by the bifurcation of Le Fanu’s ripe, innocent heroine Laura into a pair of languid sisters, Léone and Gisèle, one of whom, in becoming a vampire herself, substitutes for the absent central figure of Carmilla, whom Dreyer and Jul chose to dispense with. In the end, the issue is probably not whether the film is 100 percent faithful to the original (plainly it is not) but what Vampyr signifies in its own terms, as an autonomous aesthetic object. Its elliptical, dreamlike logic seems to demand, more than many films do, some definitive shot at interpretation. What is it exactly that we have watched here? Can we piece together what the film means? A critic who failed to ask these kinds of questions would be failing in his duty, I think, and indeed it is one of the attractive aspects of Drouzy’s approach to Dreyer that he doesn’t hesitate to give us a reading. We may or may not agree with him in the event, we may feel (as with most interpretations) that there is something reductive and simplistic about it, but at least it is there and examinable. The essence of Drouzy’s case, as I have already said, is that the film is profoundly autobiographical. He claims that it plays out as a fantastical psychodrama the ambivalence and pain Dreyer felt all his adult life about his fate as an abandoned, adopted child. In the film, the vampire Marguerite is Dreyer’s hated Danish foster mother (Marie in real life), while Léone is his beloved birth mother, whom our hero fails to rescue from suicide yet who nonetheless survives, reborn and reanimated, in the figure of her “twin” sister, Gisèle—whom our hero in due course falls in love with (just to round out the Oedipal circle). In forwarding his thesis, Drouzy makes a lot of play with proper names. Marguerite, as we have seen, elides into Marie (perhaps not so close after all? ); Gisèle and Léone are pressed together to become—in a pinch—Joséphine, the first half of the name of Dreyer’s birth mother. Her complete name, Josephine-Bernhardine, is supplied, conveniently, by the names of the castle owner’s servant, Joseph (an important secondary figure in the film), and the castle owner himself, Bernard. The reader may harbor legitimate doubts about the usefulness of this kind of Freudian detective work, while at the same time recognizing that names are an interesting aspect of the film. The fact that the vampire is given a surname is quite striking in the first place: her complete name, Marguerite Chopin, certainly has a ring to it. Then there are the different names that the hero is known by: in real life Baron Nicolas de Gunzburg (the film’s independent financial backer), he is credited in the movie with the stage name, or pseudonym, of Julian West, while—depending on which print one sees—the character he plays is called either Allan Gray or David Gray. The explanation for all this may well be straightforward—attributable to nothing more odd than the different linguistic versions of the film (French, German, and English) that Dreyer was preparing for the international market. Yet, on the other hand, if we think about it, this pluralism really does seem to symbolize something important about the film, and that is the way that the characters dissolve into each other, taking on different personas, imitating in so doing the logic of dreams, in which identity is always fluid, and you—the dreaming subject, the inventor of these phantasms—can never be quite sure whom you’re dealing with. So a fascinating aspect of the film is the way that the hero himself, and not just the heroine, is “bifurcated,” not only (though most obviously) in the scene in which, after he has tripped and fallen in the meadow, we see his soul (in double exposure) leaving his body, but also in some earlier scenes where a kind of “relay effect” is introduced by allowing the servant Joseph to take over from Gray the reading of the vampire manuscript—in effect usurping Gray’s function as authorial presence and chief guide to events (a substitution reinforced toward the film’s ending, where intriguingly it is Joseph, not Gray, who digs up the coffin and, in the censored version at least, seems to be the one who drives the fatal stake through Marguerite Chopin’s heart [see the chapter “Vanished Scenes” in Casper Tybjerg’s visual essay]). The serious theme that may be said to lie behind the vampire genre concerns the issue of life after death—in what ways such a concept may ever be true, and if true, desirable. It is a question that fascinated Dreyer throughout his life, both within and without the traditional Christian context. The meditation it encompasses is the central idea explored in what is probably Dreyer’s greatest work, Ordet (1955), from Kaj Munk’s play, which ends, stupendously, with the resurrection of the young heroine Inger after she has supposedly died in childbirth. Impossible, blasphemous, and yet (in the context the film provides for it) true, just, and compelling. There is none of the malignity and madness in that film that one finds in Vampyr. It is a different kind of poetic sublime. But with vampires, too, it is the pathos of immortality that moves us most, when we admit to being moved—the restlessness of their undead souls, the sadness of their longing to be done with it all, even as they feed on the blood of live mortals. The vampire genre gave Dreyer the chance to explore, too, a more contingent aspect of immortality, the idea of out-of-body experiences—the notion (terrifying or exalting depending on circumstances) that the soul may survive, even for a short period, the physical death of the subject, rising out of the body to look down upon it from “above,” as happens in the extraordinary sequence in which Gray, nailed into a casket, seems to observe his own progress as the coffin is carried through the streets of Courtempierre toward the cemetery. Bergman may have been thinking of this episode when he came to stage the wonderful dream early on in Wild Strawberries, in which old Professor Isak Borg, played by Victor Sjöström, confronts his ghostly double in the coffin that slides out of a broken carriage. It is a fair guess, anyway, that at one time or another many of us have dreamed of such ghostly encounters with ourselves, just as we regularly dream, too, of the beloved dead—friends and relatives departed from us who for the duration of the dream are yet back and “alive” in our company, doing their best to prove that they are immortal. Vampyr was made at a time when the technology of sound was still at a quite early stage of its development, and the aesthetics of the film still belong in obvious and important ways to the silent epoch. There is no harm in that: by the end of the twenties, the vocabulary (so to speak) of silent film had reached, internationally, an extraordinary level of refinement and sophistication. Indeed, it could be argued that a significant percentage of the most beautiful films of all time belong to this period. I refer here not only to refinement of visual composition (Dreyer himself was one of the greatest contemporary connoisseurs of painting) but also to suppleness of camera movement, which, following the innovations of Murnau in the mid-1920s, took off in a major way during the rest of the decade. Vampyr is full of terrifically soigné traveling shots that explore space and locale with freedom and daring. We are never quite sure where we are, and, for once, this confusion is productive. Yet to return to sound for a moment, the opacity (one might almost say crudity) of the dialogue is arguably in itself an “aesthetic value,” contributing importantly to the film’s uncanny, dreamlike atmosphere. (We do talk in dreams, of course, but somehow speech is not dreams’ primary element.) In later vampire movies—for example, the famous Hammer cycle of the sixties and seventies—talk is naturalized into the dramatic fabric of the scenario, at the expense, however, of atmosphere and mystery, introducing indeed, at times, an unwanted comic element: such movies slide easily into camp. It would be wrong to imagine that Dreyer was uninterested in speech. On the contrary, later films of his show, among other things, a complete mastery of the medium of sound. But in Vampyr, Dreyer intuited, correctly I believe, that, concerning atmosphere, the crucial contribution would continue to be made (where it had always been made in the days of so-called silent film) through the medium of music. And, in fact, Wolfgang Zeller’s delicately eerie score is one of the film’s quiet triumphs. The movie premiered in Berlin in the spring of 1932, but as stated previously, it was not a popular success: on its opening night, it was booed by a section of the audience, anticipating the notorious reception in Paris, some thirty years later, of Dreyer’s last sublime masterpiece, Gertrud. Nor did the film’s lukewarm welcome in Copenhagen nearly a year later help to restore the director’s equilibrium. The independence he enjoyed as a producer, while providing him with vital aesthetic freedom, had worn him down physically and mentally. As Drouzy records, the shooting of Vampyr was a draining and indeed fearful experience for all involved, taking its toll on Dreyer’s personal life. In its wake, there were the inevitable money problems. His marriage came under threat, and for a time he entered a psychiatric clinic (by bizarre coincidence, the name of this establishment, at Saint-Mandé, near Paris, turned out to be the Institut Jeanne d’Arc). At the same time, contacts reestablished with his old production company, Société Général de Films, issued only in abortive projects—a doomed Italian coproduction in Somalia—before being ruptured altogether. We are entering what Drouzy calls “les années noires de Dreyer,” the bulk of the 1930s, when rather little is known about his movements. He rested and read and wrote articles. Ten years were to pass before a new Dreyer emerged at the far side of his crisis—strengthened, reinvigorated, and ready to enter the fight again. Mark Le Fanu is a Danish-based critic and film historian who has written books about Tarkovsky and Mizoguchi. He contributes regularly to Sight & Sound and the French film monthly Positif.